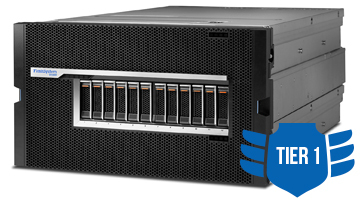 IBM FlashSystem® V9000 is a comprehensive all-flash enterprise storage solution. FlashSystem V9000 delivers the full capabilities of IBM FlashCore™ technology plus a rich set of storage virtualization features. IBM FlashSystem V9000 performs better, costs less, and integrates more easily than any other enterprise storage solution. IBM FlashSystem® V9000 delivers value into your unique data center environment through scalable performance, enduring economics, and agile integration. Today, IT infrastructure is fully entwined with basic business operations, which means that crucial business questions become information technology questions. What is it worth to stay ahead of the competition? What is a better online customer experience worth to the bottom line? What advantages are gained by making faster, more informed business decisions? Can we afford not to have the best possible fraud protection and data security? When you answer these business-critical questions in terms of IT infrastructure, and recognize the crucial role storage plays in the right answers, then the value of IBM FlashSystem™ skyrockets. FlashSystem V9000 offers the advantages of software-defined storage at the speed of flash. These all-flash storage systems deliver the full capabilities of the hardware-accelerated I/O provided by FlashCore Technology. FlashSystem V9000 also delivers the enterprise reliability of MicroLatency™ modules and advanced flash management, coupled with a rich set of the features found in the most advanced software-defined storage solutions. These include Real-time Compression, dynamic tiering, thin provisioning, snapshots, cloning, replication, data copy services and high-availability configurations. So that we can engage with you effectively, please click the Enquire button to provide us with some basic information about your current platform and the strategy goal where our expertise can help you. APSU’s Systems Management Solution provides a family of tools, utilities, monitoring and configuration for IBM Power Systems environments (formerly know as the iSeries and AS/400. With more than 10 core IBMi System Management tools, let Maximise automate your IT business processes to increase workflow efficiency. APSU and IBM Global Financing are here to help you acquire the most advanced infrastructure within your budget. Between IBM’s competitive rates and customized solutions, IBM Global Financing is the best option to help you affordably meet your hardware financing needs and stay competitive. IBM ROF tool enables instant credit checking and contract issuance for review and signing same day, allowing clients to have access to the documentation prior to purchase. IBM Global Finance helps clients acquire the latest technological solutions and services so they can innovate, grow and become smarter. Prevent technology obsolescence with planned hardware update and refresh cycles. Manage your assets for the entire technology lifecycle-from planning to acquisition, management and retirement of your equipment. Cloud computing is enabling a more cost effective, agile and flexible consumption of IT and is transforming the way companies do business. To realize these benefits companies are investing in data centers that are enabled for cloud and transforming their business processes. Adopting cloud can help your company reduce your IT costs – financing the IT infrastructure needed to operate in a cloud environment, can help take these savings further. IBM PureSystems™ combine the flexibility of a general purpose system, the elasticity of cloud and the simplicity of an appliance. They are integrated by design and come with built in expertise gained from decades of experience to deliver a simplified IT experience. IBM Project Financing™ provides credit-qualified clients with an integrated financing facility that matches the scope and duration of IBM-led services solutions including Business Analytics and Optimization and Cloud. Customized structures can often be tailored to cover the entire project’s life cycle. Project financing structures can include consulting services, implementation services, infrastructure investments, data centre equipment, business process implementation, IBM and non-IBM hardware and software. IBM Project Financing can help reduce the risk of projects being delayed or the reduction in contract scope by providing a dedicated funding source by speeding project approval and implementation. Title to the equipment automatically passes to the Client after making all payments due on the LPO. VAT on Amount Financed is invoiced and payable on the commencement of the LPO. IBM provides the right to use the software for the initial Term period. At the end of the initial Term, after making all payments due on the lease, and as long as the Client is not in default, there are no further payments due to IBM and the Customer retains continued use of the software as per the terms of the license. Title to hardware remains with IBM. b) sell the hardware as IBM's agent and retain 99% of the proceeds. Renewals and conversion amounts will be pre-stated on the financing contract upfront. IBM do not have title to the assets. At the end of the Initial Term of the loan and once the final loan payments have been made, the loan will mature and no further payments are due to IBM.